There's never a dull moment here at Long Lane Honey Bee Farms. Hi! We are David & Sheri Burns and bees are our business. We live in East Central Illinois and our entire family is involved in our honey bee operation. We manufacture and sell beekeeping woodenware and we always appreciate your business. We also sell everything related to beekeeping and always welcome your business. The primary goal of our business is to give glory to the LORD Jesus Christ through our business. The Bible says, "And whatever you do, whether in word or deed, do it all in the name of the Lord Jesus, giving thanks to God the Father through him" (Colossians 3:17). So whether we are building hives for customers, making up nucs, raising queens or answering the phones, we do it all in a honorable way that would give glory to the LORD. The last few weeks has been a whirlwind of activity. 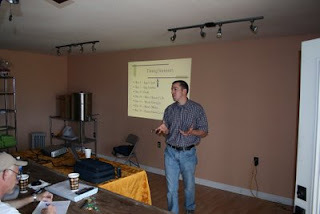 Last Friday we had another successful class here at our honey bee farm. We had 17 students who came to learn about raising queens. This class was in conjunction with the Illinois Queen Initiative, which is a work where several of us are hoping to produce queens that are more acclimated to the climate here in the mid-west. 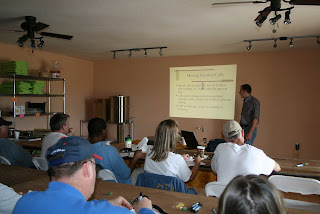 Dr. Joe Latshaw is a commercial queen breeder and he came and held a workshop at our farm and the next day presented the same workshop to another group in Chicago. 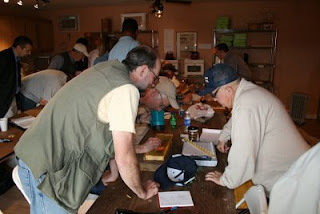 Our store/lab was full of eager beekeepers wanting to learn the fine art of raising queens. During the morning Joe gave great detailed presentations on just how to raise queens. Joe holds a Ph.D and also teaches at Ohio State University in Columbus in Ohio. He has worked bees almost all his life and has studied and worked along side the most well-known entomologist. He has become my main mentor for understanding the art of raising queens. Joe has made himself accessible to me whenever I have any questions about queens. He's a true gentleman, friend and excellent beekeeper. His knowledge, experience and wisdom in raising queens is superior. After a full morning of presentations on the details of raising queens, we broke for lunch. 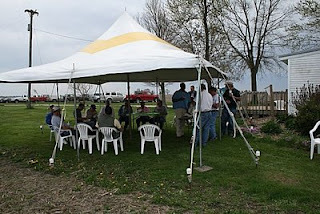 We try to make our classes and workshops as comfortable and professional as possible, so we had a tent company bring in a nice size tent so that we could enjoy lunch outside. Again, during the lunch break, beekeepers continued to pick Joe's brain as well as talking to each other about failures and successes in beekeeping. It was a nice day, though a bit windy. I enjoyed meeting beekeepers from around the state of Illinois and hearing about their special techniques of beekeeping. My wife Sheri is such a hard worker around our honey bee farm. She put the entire day together for me. She made sure our room was configured properly for the class as well as making sure lunch was brought in on time. For the last few weeks Sheri has installed packages, fed bees, answered the phone calls from our customers, helped packaged hives, data entry, taxes, Internet orders and the list goes on! Even yesterday Sheri was on the four wheeler running up and down the apiary feeding the bees. I am so blessed to have a help-mate like Sheri! Last week I needed to take a trip down to Kentucky to pick up a trailer load of beekeeping supplies. Sheri jumped in the truck with me and our little youngest son Christian and we enjoyed a two day trip down for supplies. Thanks Sheri! In the afternoon of our class with Joe, I worked to prepare a starter nuc and gathered up 5 frames of larvae so the students could practice grafting. With Chinese grafting tools in hand, flashlights, magnifying glasses in the other hand, students when to work, selecting the perfect aged larva and transferring them over into queen cell cups I had made earlier in the morning. Students helped each other and Joe was there showing each student the art of grafting. This was a great hands on opportunity. You can read all the books you can get your hands on, but until someone walks along with you, somethings are difficult to grasp. 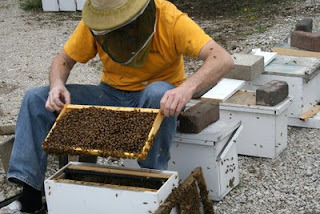 I have noticed that most beekeepers feel that raising queens is complicated and mysterious. I say that because I hear so many beekeepers say they are buying different types of "systems" for raising queens. These systems do work, but in my opinion there is much more control over raising queens through grafting than using systems. Besides, I like hands-on experience. 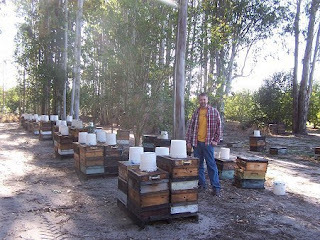 Here I am standing in David Miksa's apiary among his finishing colonies where he raises his famous queens. I told you that I visited with David Miksa. He and his operation was featured in the May edition of the American Bee Journal. It was a great article! Having seen his operation and now having read about it too, I am very pleased with his queens. I am incorporating several of his techniques into my queen rearing operation. And, of course, I'm using some of his stock in my yards for breeding as well. He has some very nice and very productive queens. I visited a hive two years ago that was headed up by a Miksa queen and I was impressed! We placed David Miksa's queens in 200+ packages, the ones that were picked up from our farm. Raising your own queens can be very rewarding as well as save you money and time. I think every beekeeper should have a 5 frame nuc with an extra queen in there as a backup emergency replacement. Or if you want to make splits then you can raise your own queens to increase your hive count. So let me give you a brief rundown on how to raise your own queens. Leave it queenless for at least 2 hours, but not too long or they might start raising their own queen if there are eggs present, which there should NOT be. completely blocked off and kept in a cool, dark place for the 24-36 hours they start the cups. When I make up my starter nucs, I leave an opening to place my queen cell frame into the nuc. I like to close off my nucs so that the bees stay in for the 24-36 hour duration. The nuc should not have any open larvae. I want my nurse bees to only care for the grafted queen cups. The goal is to make LARGE size queens and to do this, I need copious amounts of royal jelly in each cup. So the bees in the starter nuc feed the queen cells. Because this hive only has nurse bees primarily, I close it off. Nurse bees do not need to fly out, so I close it off and keep it in a cool place for the 24-36 hour duration. Because I usually graft between 30-40 cell cups, I have to move this frame out to a larger hive that can continue doing what this starter hive started. 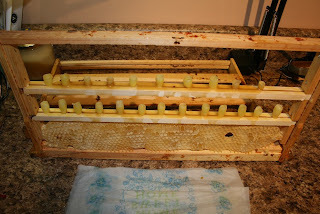 After 24-36 hours in the starter nuc, transfer cells into a queenright finishing hive. old. Then, on day 8-10, transfer the cells into a queenless mating nuc. The mating nuc can be anywhere from a complete large hive that is queen less down to a mini-mating nuc with only 2 or three mini-frames. 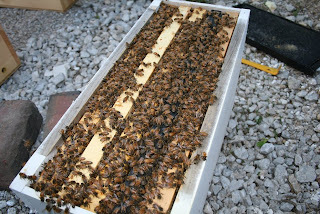 It works best to transfer the 10 day old queen cell into a queenless nuc on day 10. Bees always accept a queen cell, much better than an emerged virgin queen in a cage. When I graft, I make my own queen cups from my wax that I know is chemical free. Then, I attach the cups with wax and then I place large amounts of wax on the bar so the bees can use my wax to continue to draw out the queen cells. I also make my own frames and cell bars. I dip my wax after melting it in a large electric pan that I bought at Wal-mart for $50. I place my graft into a queen cell cup frame that I've just made up myself. They are easy to make by modifying a deep frame . The one in the picture, of course, is upside down. Don't worry, when you flip it over the larvae will not fall out. They are sticky and stay put. Also, you really do not have to worry about temperature when they are this young, 1-2 days old. Notice I graft with several layers of wet paper towels because the larvae do need to remain moist. The grafting technique must be hands-on. For example the larva must only breathe on one side when they are this young. Therefore, you must place them in the new queen cell with that same side up. If you flip it over, they will suffocate because they are not yet breathing on both sides. Then I go out to my bee yards and transfer the 10 day old cells into queenless mating nucs. I mainly use 5 frame nucs with deep size frames or 3 frame nucs with deep size frames. As you can see, these nucs make nice chairs too when working down the line. You can click on any of these images for a larger view. I work my bees with only a hat and veil because my bees are gentle and I hate wearing gloves. Though I do not have to wear a hat and veil, I feel it is essential to protect the eyes from stings. I never want to take a chance, nor should you. The success of the beekeeper will be greatly increased by his or her ability to raise their own queens.